The thermograms provide thermal maps show that, with spots of different colors, the temperature of the surfaces of the materials and the possible presence of processes of cooling or heating. The surface evaporation of moisture from the damp walls is always present if the relative humidity of the air is less than 100%. 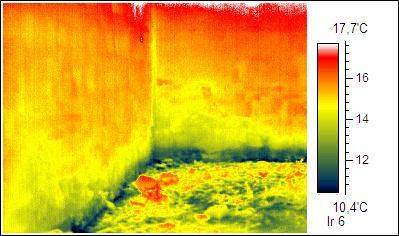 The speed of evaporation of water from the wet surface is in fact related to the environmental conditions: the higher the moisture of the wall and the lower the relative humidity of the ambient air, the greater will be the evaporation and the more pronounced temperature differences surface visible in thermography. 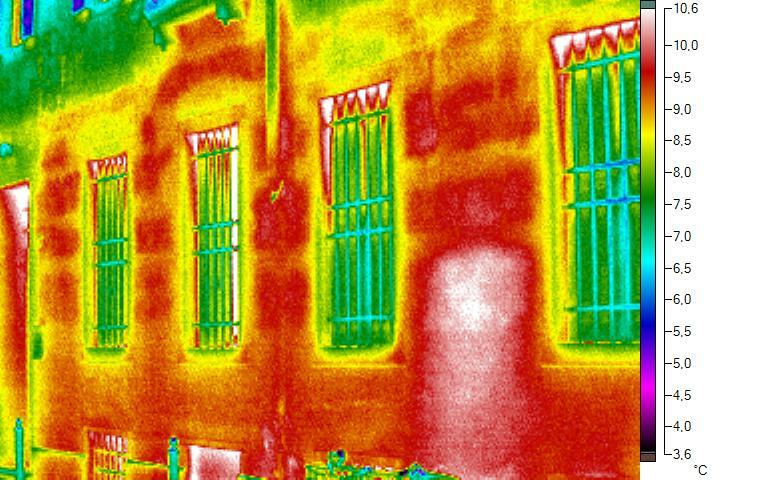 The evaporation is an endothermic process, then subtracts heat to the wall surface (as well as to the surrounding environment) in the thermal image that is normally colder where moisture is present. There may be rare cases in which, after prolonged exposure to the sun and the next step in the shadow of the wall, and then the beginning of its cooling, the wetlands of the wall which are more hot. This is due to the higher heat capacity of water, which retains the longer the heat absorbed during the heating phase, with respect to the areas with the absence of moisture that they respond more quickly and therefore are locally colder. The humidity from rising is particularly harmful because it may cause, due to the salts, the physical disintegration of the wall structure. 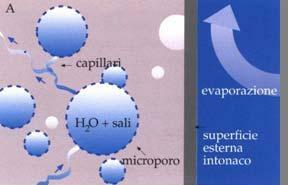 The water, rich in saline substances, salt by capillary action within the wall structure plaster. For subsequent evaporation takes place the deposit of salts in the micropores of the plaster (phase 1). 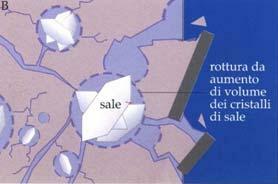 The salt, crystallizing inside the micropores, increases in volume thereby exerting a pressure on the inner walls of the pores leading to rupture and disintegration of the plaster (phase 2). The increase in humidity can also be diagnosed with the combined application of two sensors, one with a depth of 3 cm and the other with a depth of 30 cm. 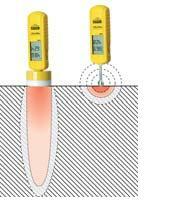 With the combined use of the two measurement processes at different depths, by performing a detection grating, on the basis of values relating to the surface and the depth is possible to obtain reliable results on the different distribution of moisture in depth in the same area of the surface investigated. 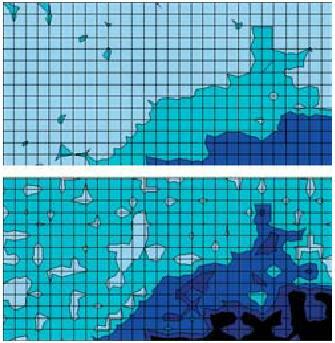 Moisture distribution in the same area of investigation but at different depths: surface (rectangle at the top) and deep (rectangle below). The darker areas correspond to greater presence of moisture, and being present in greater depth and downwardly of the wall lead to a diagnosis as the cause of the problem moisture by capillary rise. Source: Trotec documentation (www.trotec.com). – Location of the ventilation ducts in the walls.